A growing number of entrepreneurs seeks to build profitable ventures in home-based medical care. A few months ago, 82-year-old Faridabad resident Rukmani Devi Jhamb was diagnosed with leukaemia. After a few days in a hospital, she was moved back home with a medical prescription. She was weak and immobile, so the doctor suggested she hire the services of a home care agency for blood transfusion. And she readily found one. Until recently, only hospitals did blood transfusions, but now, patients who can cough up can get them at home. Big investors are getting into home health care , using technology and the cloud, and trying to set benchmarks. Their success depends on getting the combination of service charges, delivery efficiency and market response right. In July, serial entrepreneurs K. Ganesh and his wife Meena Ganesh bought out Delhi-based Portea Medical Pvt Ltd, founded by entrepreneurs Zachary Jones and Karan Aneja. Portea offers in-home services such as nursing, physiotherapy, and doctor visits in seven cities. The couple raised $8 million (Rs 48 crore) in venture funding from Accel Partners and Ventureast in December. Meena says they are open to buying smaller companies in the sector to expand their footprint and plug gaps. In September last year, technology entrepreneur V. Thiyagarajan sold a 26 per cent stake in his Chennai-based company, India Home Health Care (IHHC), to US-based Bayada Home Health Care. In October, the Burman family (the promoters of Dabur) formed a joint venture with the founders of the UK-based Healthcare at Home, in which the Burmans will hold 65 per cent, while the rest will be held by founders Charles Walsh and Gareth Jones. Started in April last year, the venture plans to invest Rs 200 crore over the next three years. It functions in two cities - Chandigarh and Delhi - and plans to spread to 10 cities. The Ganeshes, who have tasted success with earlier ventures - they sold online tutoring firm TutorVista for $213 million to Pearson Plc - are upbeat. "We got into this space because ego guided us that we do something bigger than TutorVista," says Ganesh. "This is a large business in the US, but there are no players in India." He adds that their skills for project execution, building scale and a consumer brand stand them in good stead. He says the opportunity is huge, because India has 150 million people aged 60 years and above. According to him, another reason behind the opportunity is that hospitals get more revenue per bed with patients scheduled for surgery than with prolonged post-operative care. Meena adds that most of Portea's 250 employees are nurses, and the company notched 3,000 home visits in Delhi and Bangalore in December alone. Some companies rely heavily on technology. For instance, Portea's nurses upload patient records using handheld devices. Their reports are reviewed by a central medical quality team, so the doctor gets to up-to-date information and the company can ensure delivery meets high standards, says Meena. IHHC uses paper documentation, but plans to upgrade to handheld devices. The Burmans' joint venture, called Health Care At Home (HCAH) India, offers in-home services such as post-operative care, elder care, infertility treatment, critical care, home oncology, physiotherapy and respiratory care. "Local nursing agencies provide only supportive care - they may or may not have medical care," says Gaurav Burman, co-founder of HCAH. "We do chemotherapy at home. We have set up ICUs at home." For specialised services, HCAH hires nurses who have more than five years of specialised experience. Recruited nurses get two months' training, in a classroom and through simulation models. To ensure quality service delivery, HCAH's specialised nurses use company cabs, and must press a button on their handheld device when starting their journey. In case of a delay, the central office calls them to know the reason, and the customer is informed. HCAH says it constantly tracks the percentage of delays. "These percentages are ridiculously low - five to 10 per cent, and delays are largely due to issues beyond our control, such as traffic jams," says Vivek Srivastava, CEO of HCAH. As these companies plan to scale up, getting the right talent could be a challenge. Already, HCAH pays nurses 10 to 15 per cent more than hospitals do - and there are greener pastures. "If you compare with some foreign locations, the pay scale difference could be five times," says Srivastava. "The salary difference cannot be matched. If we scale up, we will be hit by attrition." Sheeba George, a nurse who joined HCAH after working in a Singapore hospital, says home care is different from a hospital job. "It's more personalised and relaxed," she says. "In hospitals, we handle four or five patients at a time. In home care, we handle a maximum of three patients daily, one at a time." For young home care companies, much depends on how they price their products. Will they follow the telecom model, in which companies started out with steep tariffs and expanded rapidly as call rates fell? "Affordability remains a big issue," says octogenarian customer Jhamb. She says HCAH charged her Rs 7,000 to transfuse two units of blood, while Fortis Escorts Hospital in Faridabad charges Rs 5,600. "It's a myth we are trying to break," says Srivastava of HCAH. "There are certain services that are more affordable than hospitals." For instance, he says, setting up a home ICU costs 50 per cent less than a similar hospital set-up. HCAH says its target customers are middle class, with a household income of at least Rs 5 lakh a year. Portea's Ganesh says it is not easy to enter the business, even though it is unregulated and there are no official standards. Managing home care infrastructure is complex, he adds. "I expect there will be five players in this field," he says. "We want to be among the top three." There are standards for services such as radiology, dentistry, wellness and laboratories, and experts say home care standards are a matter of time. Four years ago, while searching for a nursing agency for his friend's mother, Thiyagarajan found that there was no institutional player in home-based medical care. He did some more research and invested Rs 1 crore to start IHHC. Since then, life has been a roller-coaster ride. Soon after starting out, he considered pulling the plug because of high attrition (40 per cent) and losses. But he figured his business model was not right. Till 2011, his workforce consisted of nurses registered with state nursing councils. But most of IHHC's services, such as supportive and post-operative care, did not require a nurse, and could be performed by a cost-efficient medical care-giver. So Thiyagarajan decided to hire more care-givers, and train them to perform non-clinical tasks through three months of classes and a month of on-the-job instruction. Today, nearly 80 per cent of IHHC's staff are medical care-givers, and 15 per cent are auxiliary nurse midwives. Only five per cent are registered nurses. This lets IHHC offer services at various price points, and has cut labour costs by 30 per cent. The attrition rate is also down to 10 per cent. "Nurses are always in demand, due to constant poaching by hospitals," says Thiyagarajan. "Low attrition helps us keep bench strength low." IHHC broke even in mid-2012, and expects to end the current financial year with revenues of $2 million. Portea works closely with corporate hospitals and insurance companies, and offers packages to companies to encourage employee enrolment. "It would cost us about 15-20 per cent to acquire a patient from a hospital," says Meena Ganesh. The percentage refers to the proportion of a typical month's home-care charges that Portea pays the hospital to acquire a patient. Portea says 30 per cent of revenues come from working with hospitals and insurance companies, and the rest from working directly with customers. Thiyagarajan says in-home care is a highly localised business, so knowledge of one market cannot always be implemented in other markets. Customers, affordability and medical requirements vary. Also, because nurses are not well paid, localising services reduces their accommodation and commuting expenses. Indian companies are better equipped to understand the market than foreign ones. When Bayada first entered India about three years ago, it was unable to crack the market. But through its stake in IHHC, it could make a difference. "We have understood the Indian model and now we want to leverage Bayada's expertise in expanding and improving existing operations," says Thiyagarajan. "They have a network of over 23,000 nurses." 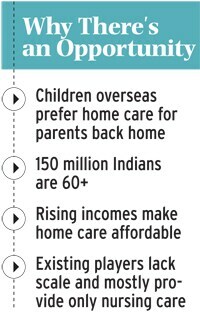 Private equity and venture capitalists, too, are interested in the home care business in India. Delhi-based Alacurity Services, for instance, is funded by investment banking firm InQvent Holding, also based in Delhi. Mahendran Balachandran, Partner at Accel, says his company has invested in Portea because it blends health care with technology. "It is too early to say how quickly customers will accept, but we are optimistic the model will work," he says. "I think we will need five to seven years to get good returns." The business has begun to attract even hospitals. Manipal Hospitals became the first corporate health-care provider to enter the sector in April 2010. Its plans to expand its home-care services - currently available in Bangalore, Mangalore and Manipal - to Salem in Tamil Nadu and Vijayawada in Andhra Pradesh soon. "At present, we want to offer services only where we have hospitals. Later, we will go beyond hospitals," says S.C. Nagendra Swamy, President of Manipal Health Enterprises, the company that owns Manipal Hospitals. "We started home care as an extension of services to our own patients, but now we offer it to others, too." Swamy says home care services include complex procedures such as dialysis and chemotherapy. He adds that the home-care services make some 9,000 home visits a year, and the business has broken even. Studies show that people who receive post-surgical rehabilitation care at home are likely to have a better quality of life. However, a hurdle that in-home care businesses face is that many health-care professionals prefer to work for a hospital than for a home-care company, says Somnath Das, founding member of National Accreditation Board for Hospitals and Healthcare Providers. While the business potential is undeniable, some wrinkles need to be ironed out. For instance, wheelchair-bound Chennai resident Kamala Ramaswamy pays Rs 38,000 per month for IHHC's nursing services. She says her overall experience is all right, but there is one problem. "The nurses are mostly late by 30 minutes to one hour." However, she says, finding another agency she can trust would be tough. "I am used to their services," she says.